Kidney tumors represent 3% of adult cancers. The low grade tubular-mucinous carcinoma is defined by the classification of kidney tumors published by the world health organization in 2004. This tumor is poorly described in the literature. We report a case of 30 year-old-woman with a primary low grade tubular-mucinous kidney carcinoma which was revealed by sensation of heaviness located in the left lumber zone. Physical examination was normal. Ultrasounds and abdominal computed tomography (CT) revealed a solid mass in the middle of the left kidney. The patient underwent left radical nephrectomy. 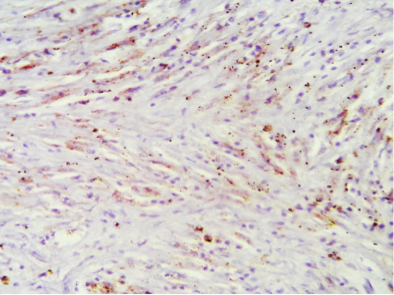 Pathological and immunohistochemical study of the nephrectomy specimen confirmed the diagnosis by showing fuso-cellular tumor proliferation and the expression of epithelial tissues markers: cytokeratin 7/19, AE1/3 and racemase. The outcome was favorable after 20 months of follow-up. The prognosis of this pathological type is very good in the literature because of the low grade of the tumor. Kidney tumors represent 3% of adult cancers . The low grade tubular-mucinous carcinoma is a new entity defined by the classification of kidney tumors published by the WHO in 2004. This tumor is poorly described in the literature . We report a rare case of a primary low grade tubular-mucinous kidney carcinoma and discuss the diagnosis and management challenges. The purpose of this observation was to describe the therapeutic and prognostic characteristics of this rare histological type. Figure 1. 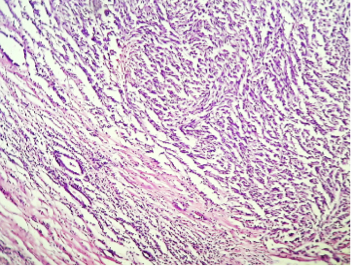 Tumor proliferation with epithelial contingent (tubes) and spindle cell (*10). A 30-year-old woman without medical history presented a sensation of heaviness located in the left lumber zone for twenty months. The sensation was persistent and not related to exercise or any other activity. Figure 2. The nuclei had fine chromatin without major cytonuclear atypia (*40). Physical examination was normal. Ultrasounds and abdominal CT revealed a mass in the middle part of the left kidney which was well circumscribed and measured 4 x 4cm, with no thrombosis of the inferior vena cava nor metastases. No nodes were visible. The patient underwent left radical nephrectomy. Pathological study of the nephrectomy specimen showed fuso-cellular tumor proliferation respecting the hilum and fat without capsular break and without nodes (Figures 1, 2). 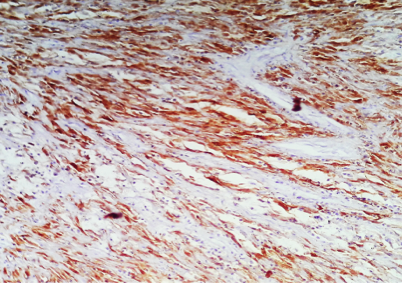 The immunohistochemical study showed the presence of antibodies: cytokeratin AE1 / AE3 (Figure 3) and cytokeratin 7 (Figure 4), without markers expression of the angiomyolipoma: AML and HMB45. Figure 3. Cytokeratin AE1/AE3: positivity of tubular and spindle contingent. 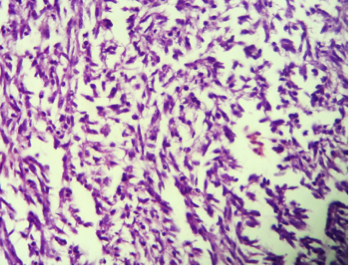 The combination of cytological, pathological and immunohistochemical data (Figures 1-6) confirmed the diagnosis of the low-grade tubular-mucinous carcinoma. The size and limits allowed to classify the tumor pT1bNoMo. No adjuvant therapy was indicated for the patient after multidisciplinary consultation meeting. The final evaluation 16 months after treatment showed no suspicious lesion in the left renal lodge, lung, hepatic or lymph nodes. Figure 4. Cytokeratin 7: cytoplasmic markers on the two contingents (*10). Actually, the patient is in complete remission after 20 months of follow-up. The low-grade tubular-mucinous carcinoma is a new entity in the WHO 2004 classification of epithelial tumors of the kidney. Histological subtype is unique and has been described for the first time in 1998. Less than 80 cases have been reported in the literature. It is also called low-grade spindle cell carcinoma. It preferentially affects women of the fifth decade [1-4]. The patient of this observation was 30 years old. Figure 5. AMACR (Racemase): focal cytoplasmic marking. According to the French Association of Urology, conservative surgery should be avoided if central location or tumor size are greater than 4 centimeters . This kidney tumor was classified in the high complexity group according to morphometric scores which were calculated (RENAL score: 11a, PADUA score: 11), so the patient underwent left radical nephrectomy. Figure 6. Alcian blue: mucin deposits. Analysis of the specimen showed a well-demarcated medullary tumor measuring six centimeters. Fericot et al. reported in 2005 a series of 15 patients: the macroscopic appearance of low-grade tubular-mucinous carcinoma was circumscribed medullary tumors and the mean size was 6 centimeters. It was gray-white lesion with rare hemorrhagic and necrotic remodeling . This was consistent with our findings in macroscopic analysis of the nephrectomy specimen in our case. 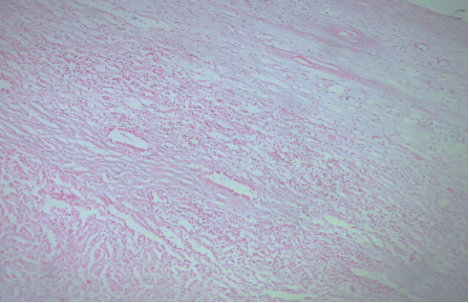 Histologically, the tumoral tissue contains two cell contingents: tubular and spindle areas. 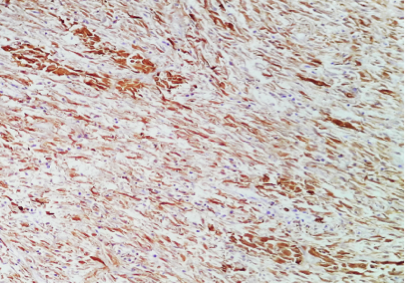 That is why this histological type has a second nomination « low grade spindle cell carcinoma » [1, 4].The immunohistochemical study of tubular-mucinous carcinoma showed the presence of epithelial tissues markers: cytokeratin 7/ 19 , AE1/3 and racemase . In our case, the immunohistochemical study was positive for cytokeratin 7 and AE1 / AE3 and racemase (Figure 1,2,3,4,5,6). In terms of molecular biology, no signaling channel or specific genetic alteration has been described [1-4]. The prognosis of these tumors is very good as reported in the literature because of the low grade of the tumor . Low-grade tubular-mucinous kidney carcinoma is very rare tumor. The prognosis is very good because of his histological characteristics. Carcinogenesis mechanisms are still unknown and should be defined in the future. No competing interests declared by the authors. All the authors contributed in this manuscript. Compérat E, Camparo P. Classification histologique des tumeurs malignes du rein à l’heure des révolutions diagnostiques et thérapeutiques. Journal de Radiologie Diagnostique et Interventionnelle (2012) 93, 243—253.